Adaptec uses the most advanced 3D printing and computer aided design technology available to create custom precision built prosthetic devices. Our clinics and research facilities are the world leader in prosthetic technology. Adaptec clinicians are American Board Certified and are leading the industry in advanced socket technology and fitting techniques. At Adaptec Prosthetics we pride ourselves as being the national leader in vacuum socket technology. Fitting advanced internal socket vacuum systems that improve how connected you feel to the prosthesis and provide an unprecedented level of control. Unlike all other prosthetic suspensions, vacuum can improve the health of your limb. Our same day care program allows you to receive your prosthesis the very same day you are casted. Adaptec's proprietary fabrication processes and fitting technology enable us to fit the most complex prosthetic systems in a matter of hours. 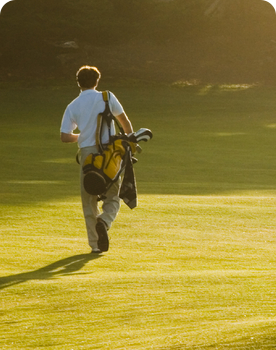 Our philosophy is simple, we see you not as patient, not as an amputee…but as a member of our family. Adaptec Prosthetics is a completely new kind of prosthetic facility with a special focus on providing same day prosthetic care. We have raised the bar in prosthetic care in Colorado to provide better care to amputees through better technology and better patient care practices. Since 2005 we have dedicated our practice to helping patients facing some of the most complex prosthetic fitting issues. Our founders realized Amputees today are still being treated with low-tech solutions with respect to socket technology and patient care. The most common method still used today to make prosthetic sockets is with plaster of Paris and a plaster file, exactly the same as it was nearly 50 years ago? The primary reason for this old fashion approach is that many prosthetic clinics lack the funding to purchase modern fabrication equipment or they become set in their ways and resist new technology. This lack of technology is a patient problem, due to the lack of technology advancement …patients are often impacted. They face long delays before getting their prosthesis, poor comfort or fit and multiple trips to the prosthetic clinic just to keep walking… When changes must be made to the prosthetic system, patients undergo the same process again and again. 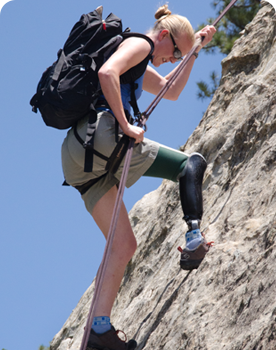 Adaptec Prosthetics has established itself as one of the most comprehensive prosthetic care clinics in the nation. If you are experiencing pain, discomfort or feel your prostheisis is holding you back we implore you to come see us for a free consultation and prosthetic evaluation. If you have not experienced what same day care is like you are in for a surprise… Imagine not waiting weeks for your prosthesis to be done, no delays for adjustments, having a shower prosthesis, a flexible comfortable prosthesis to wear each day and even a prosthesis that can talk to you through your iPhone! We will introduce you to the all of the technology that is available (and some new stuff that is not) and help you design a prosthetic system that fits you needs and lifestyle. With our state of the art laboratory we will design and build your prosthesis in a mater of hours (basically while you wait). This clinical method allows us to truly capture you limb shape at that exact moment. You can expect to walk out of our facility with your prosthesis and begin living from day one… Patient choice is a cornerstone of Adaptec’s patient care philosophy, with our advanced technology you can actually trial different types of sockets and suspension (ways to hold the limb on), foot systems and knee units before deciding on which system is right for you. 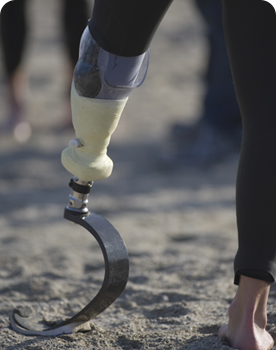 At Adaptec we have raised the standard of care in the prosthetic industry by providing the most advanced socket design available …the X-LIM flexible socket. We believe in research and development continually strive to make life better for amputees. Adaptec has helped co-develop the worlds first intelligent socket system, the SmartPuck.